As part of my personal Alzheimer’s prevention program, I’ve added ukulele lessons to my life. In addition to now being able to play both “Sea of Love” and “Hallelujah,” I got a firsthand demonstration of how people absorb information. 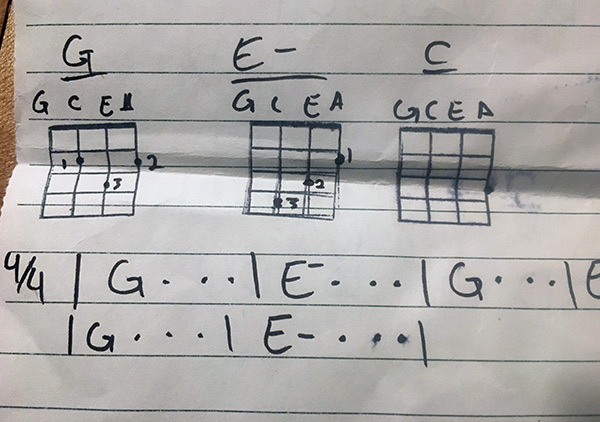 I’ve always known that some people are “visual” learners and other people are “doers.” But my experience trying to learn finger placement for uke chords really made this knowledge come to life. 1. Graphic Recording: I saw this in action when I was doing focus groups with members of a professional association at their annual conference. An AMAZING graphic recorder from ImageThink (a fellow woman-owned, Brooklyn-based small business!) stood in the room with us at a huge foam board and did a visual rendering of all the key themes and connections that came up. It was inspiring to watch him in action — and better yet, my report was 90% done when I walked out of the last group! Quick turnaround qualitative, anyone? 2. Podcast Reports: My friend and colleague Casey of NimbleMR has recently introduced podcast reports to her repertoire. She already had a side gig doing a podcast about knitting and was easily able to segue into podcasting about research results– a totally different delivery from our typical visual reports, and great for a client who wants to absorb findings on their commute!